First Indianapolis 500 run in 1911, won by Ray Harroun. Traditionally run on Memorial Day Weekend since 1911 except war years, 1917-1918; 1942-1945. Track once paved with 3.2 million bricks, nicknamed the "Brickyard"
"Yard of Bricks" remains at start/finish line. Speedway Hall of Fame and Museum is one of racing�s most famous museums. Promoter: Owned by the Hulman - George family, Hulman & Co., Terre Haute, Ind. 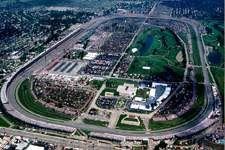 The Indianapolis Motor Speedway was built on 328 acres of farmland five miles northwest of Indiana�s capital city in spring 1909. Financed by four local businessmen, Carl Fisher, James Allison, Frank Wheeler and Arthur Newby, it was planned as a year-round testing facility for the fast-growing automobile industry in Indiana. Occasional race meets would be presented at the track, featuring those very same manufacturers racing their products against each other. Spectators, it was reasoned, would be sufficiently impressed as to want to head downtown quickly to the showrooms for a closer look at one of these newfangled contraptions. Four turns, each banked at nine degrees and 12 minutes and measuring exactly 440 yards from entrance to exit, were linked together by a pair of long straights and, at the north and south ends of the property, by a pair of short straights to form a rectangular-shaped 2�-mile track as dictated by the confines of the available land. With the original surface of crushed rock and tar proving to be disastrous at the opening motorcycle and automobile racing events in August 1909, 3.2 million paving bricks were imported by rail from the western part of the state in the fall. The bricks were laid on their sides in a bed of sand and fixed with mortar, thus inspiring the nickname "The Brickyard." Poor attendance at a trio of three-day meets on the revamped surface in 1910 caused the owners to rethink their plans and focus instead on a single event for 1911. They envisioned it as an event of gigantic proportions offering a huge purse. On May 30 - Memorial Day - a grueling 500-mile race paying $14,250 to win took place, enjoying instant success and attracting universal recognition ... and making history as the inaugural Indianapolis 500. With the exception of an additional program of racing on a single day in September 1916, no race other than the Indianapolis 500 was took place at the Speedway until a tremendously successful NASCAR stock car event, the Brickyard 400, debuted in 1994. The "500" was suspended during America�s involvement in the two world wars, 1917-1918 and 1942-1945, but held in all other years. In 1999, the "500" will be presented for the 83rd time. Asphalt was first applied to the rougher portions of the track in 1936, and by 1941 all but the greater part of the mainstraight had become blacktop. The remainder of the bricks were finally covered over in fall 1961. Most of the original paving bricks are still in place underneath the modern asphalt surface, with only the famous "yard of bricks" still exposed at the start/finish line as a nostalgic reminder of the past. The track has changed ownership only twice. With Carl Fisher heavily involved in the development of Miami Beach and Jim Allison�s nearby engineering company growing rapidly, the original owner foursome sold IMS in 1927 to a group headed up by WWI flying ace Eddie Rickenbacker. Rickenbacker had actually driven in several "500s" before he ever knew how to fly. One of Rickenbacker�s first actions was to install an 18-hole golf course on the grounds in 1929, now known as Brickyard Crossing Golf Resort and Inn and home of an annual SENIOR PGA TOUR golf tournament, the Comfort Classic at the Brickyard in September. Allowed to fall into a terrible state of disrepair as a result of four years of neglect during World War II, the Speedway was purchased in 1945 by Terre Haute, Ind., businessman Anton "Tony" Hulman Jr. He immediately embarked on a phenomenal rejuvenation program that began the transformation of the facility into what it is today. Hulman passed away in October 1977, but to this day members of his family perpetuate the traditions of the Speedway - now encompassing 559 acres - while continuing to transform it beyond the wildest imaginations of its founders. Another chapter was added to the Speedway�s glorious history in December 1997 when President Anton H. "Tony" George, Hulman�s grandson, announced that the United States Grand Prix Formula One race would take place annually on a new road course at the Speedway starting in 2000. Construction began immediately on a 2.55-mile, FIA-approved road course that incorporates Turns One and the main straightaway of the existing oval. The 2.5-mile Indianapolis Motor Speedway opened in 1909 as an automotive testing and competition facility at a time when the burgeoning car industry was thriving in Indiana. When its first series of races -- including motorcycles and many types of cars -- caused the track's original crushed stone and tar surface to break up, the Speedway immediately was repaved with 3.2 million bricks. It has been known as the "Brickyard" ever since. Interestingly, most of those bricks remain in place today under the Speedway's modern asphalt surface. Since 1911, the speedway has been home to the famed Indianapolis 500. In August 1994, the NASCAR Winston Cup Series visited the track for the inaugural Brickyard 400. A capacity crowd -- the largest ever to witness a NASCAR event -- watched Indiana native Jeff Gordon make history as the first Brickyard 400 winner. Seven-time series champion Dale Earnhardt claimed victory at the second Brickyard 400 in 1995. The 1996 winner was Dale Jarrett, while Ricky Rudd claimed the win in last year's event. The track is unique in its configuration, with straightaways between Turns 1 and 2, as well as Turns 3 and 4. Despite its relative lack of banking, it is the site of some of the highest speeds in motorsports, and a legend among race fans and drivers alike the world over. Carl G. Fisher was the speedway's founder and sold it to World War I flying ace Capt. Eddie Rickenbacker in 1927. Rickenbacker sold it to Tony Hulman in late 1945. Early in Hulman's tenure the Indianapolis 500 grew to national prominence. Hulman's daughter, Mari Hulman George, is today the Indianapolis Motor Speedway chairman. Her son, Tony Hulman George, is the track president. Location: 4790 W. 16th Street. Bordered by 16th Street on the south, Georgetown Road on the west and 30th Street on the north. The US Grand Prix at Indianapolis took place on a new course constructed within the confines of the Speedway oval, and ended a nine year Formula1 absence in America. The first US Grand Prix took place on December 12th 1959 at Sebring in Florida and was won by New Zealander Bruce McLaren. It then switched to Riverside California in 1960 and was won by Stirling Moss. Still in search of a permanent home it moved to Watkins Glen in upstate New York for 1961, and remained there until 1980. It has been won by only two Americans in its time, Phil Hill and Mario Andretti, and its return to the Formula1 calendar is extremely welcome. The NASCAR race at Indianapolis Motor Speedway will have a new name next year. Insurance giant Allstate announced it would not renew its title sponsorship of the race, which ran for the fifth time Sunday as the Allstate 400 at the Brickyard. Speedway spokesman Ron Green said a replacement won't be aggressively sought, and the race is likely to revert to its original name: the Brickyard 400. Allstate refused to pay an advertising premium required by ABC/ESPN, so its name was not used during the telecast. The network struck a separate naming rights deal with a restaurant chain and billed the race as the "Brickyard 400 presented by Golden Corral."